Blue School has opened a new facility at 156 William Street a few blocks from the its longtime home at 241 Water Street. The new campus cover the first four floors at 156 William Street. The school purchased the 35,000 s/f second and third floors from then owner William Macklowe Co. in 2015 and leased the basement and first floor from the private owner, according to a spokesman. Founded in 2006 by six artists, including the three original members of Blue Man Group, Blue School currently enrolls approximately 300 children from age two through the eighth grade. The new school will serve grades 4-8 teaching a curriculum recognized for its innovative teaching methodology that balances academic mastery, self and social intelligence, and creative thinking. 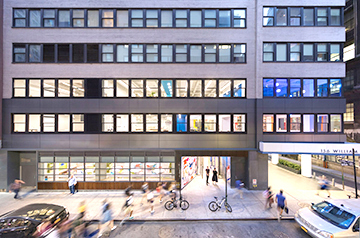 The school has grown significantly after first establishing itself in the South Street Seaport District and the campus expansion will allow it to increase its programming, double its student body over the next 10 years, and position itself to serve the expected continued demand for quality education in Lower Manhattan and Brooklyn. “Since our founding, Blue School has added one grade level per year to grow with our student base,” said Gina Farrar, PhD, Head of School. Designed by the Rockwell Group, the additional space totals 45,000 s/f over four floors with flexible modern classrooms and specialized spaces for learning. New amenities include a Commons, double-height library, a STEAM lab and art room, and a 1,600 s/f space for sports and exercise that doubles as an auditorium. CBRE represented the Blue School in the deal.